Nurturing and designing an indoor or outdoor garden is both rewarding and beautifying. Creating a balcony or small window garden in the form of cacti displays, terrariums, or vegetable gardens brings the lightness of outside indoors. For those with more space, an outdoor garden is just as fulfilling and can be crafted using local or exotic plants. But where is the best place to purchase plants in Connecticut? Read on to learn more about the best garden centers and nurseries, and start designing your dream garden today! Burnett’s Country Gardens has massive grounds with a well-cared for selection of local and exotic plants. The greenhouses feature a great selection of spikey cacti, sweet-smelling rose bushes, tropical indoor plants, and perennials. A one-stop-shop, Burnett’s also has soil, mulch, pots, and more to finish off your indoor or outdoor garden. With seasonal flower events, such as the upcoming Magnolia Festival, Broken Arrow is more than a place to buy flowers, trees, and shrubs. Specializing in rare and unusual plants, shrubs, vines, and trees, Broken Arrow aims to please even the pickiest of home garden botanists. All plants are listed by their scientific and commons names to aid in plant selection and they offer shipping for your convenience. To provide ideas for your home, Winterberry Gardens offers tours of their landscaped gardens, as well as educational seminars. They have a wide selection of hanging plants—perfect for your front porch—trees to provide shade in the coming years, and both perennials and annuals to add a splash of color. Terrain’s only location in Connecticut, this Westport garden center is as serene as it gets. You’ll find any and every piece of modern home décor at Terrain, along with all gardening essentials. Purchase one of their cascading jasmine hanging plants to put on your front porch, or choose from one of their grow kits, seed mixes, and flower, vegetable and herb seeds. They also have the cutest gifts, featuring everything from gardening books, to candles, to jewelry. Ballek’s Garden Center sells herbs, shrubs, and trees to allow you to add texture and varied bloom times to your garden so it is stunning in all three seasons. They also have tender tropical plants like jasmine, camellias, and orchids for indoor gardening. Open for more than 50 years, Summer Hill Nursery focuses on rare plants and hard-to-grow varieties. For balconies or window boxes, Summer Hill Nursery has a mini plant collections. They also have plants perfect for outdoor rock gardens or areas of your garden that may be too wet or too dry and sandy. On their 13 acres of land, Garden Barn Nursery grows thousands of plants and also sells garden accessories. If you are a pet owner, you’ll appreciate the special section of plants safe for pets. Their double take orange storm quince, with its showy flowers, would be a lovely tree to add both color and shade to your yard. If you’d like to plant a garden to attract native pollinators, like birds, bees, and butterflies, stop by Earth Tones Native Plants Nursery. Here you’ll find grasses, flowers, ferns, and shrubs native to New England. Consider beautiful lobelias to attract hummingbirds and milkweed to attract butterflies. Focused on daylilies of all colors, Bloomingfields Farm has varieties that bloom from early to late. If you can’t stop by the farm, Bloomingfields also offers shipping of all their daylilies. If you are concerned with pesticide use, don’t worry here as all plants have been grown organically since 1980. Holdridge provides visitors with a one-stop-shop for lawn and garden maintenance. They have plants to introduce to your at-home water garden, or tropical plants to liven up the inside of your home. 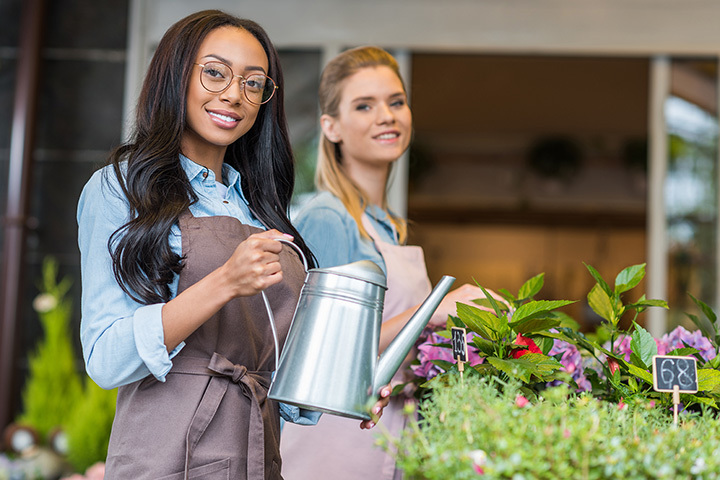 Their in-house florist can prepare floral arrangements for any celebration and custom potting is available for your deck or balcony container garden. Reynolds Farms began in 1959 and to this day, takes pride in providing “old-fashioned service” to its customers. The nursery grows over 250 varieties of perennials. Visit their greenhouse to see everything from palms, ivy, and topiaries, to philodendron, lemons and pothos. Reynolds Farms also provides lawn care products, firewood, and Christmas décor for when the holidays roll around!